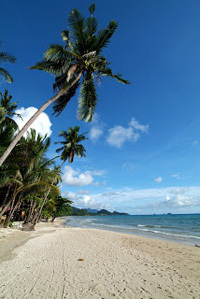 The Ko Chang archipelago with it´s 52 islands combine a balmy tropical climate with the lovely temperament of the Thai people, deserted long white sandy palm tree lined beaches, secluded anchorages and a scattering of world class resorts mixed with traditional Thai Fishing villages. The Ko Chang Marine Park offers some of the very best snorkeling and diving spots in Thailand, if you are seasoned divers we can arrange to have meet-up diving or even a private dive course onboard. Beyond the abundant beaches, tropical rainforest walks and tender rides to tropical waterfalls awaits paradise. For chartering in the Ko Chang area the limousines will pick you up at Trat airport or why not, take a Private Charter flight to the Six Senses resort for transfer directly to the yacht. We recommend a week time for exploring this area and all our Ko Chang Charters will be MYBA +APA. We will waive the cost for the yachts delivery for charter of 7+ days. Day 1-3 Ko Kut, - Ko Kut is special and stands out as one of the most spectacular cruising locations in the region. 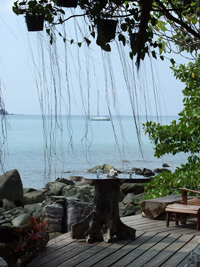 Ko Kut's isolated location gives reason to its exclusivity as a tourism location. Some of what Ko Kut has to offer includes A Check Ki, a stunning palm tree lined white sand bay which is home to the Captain Hooks Resort. This is a perfect spot for sunset cocktails and seafood BBQ. Ko Kut is also the home to the Soneva Kiri, a "six" star facility in an outstanding location offer the highest international standards in food, beverage, spa and leisure facilities including a dedicated chocolate room, cheese and charcuterie rooms and subterranean world class wine cellar. There are literally dozens of beaches and bays to explore in Ko Kut and tender boat excursions up mangrove lined rivers to discover hidden temples and tropical waterfalls are some of Ko Kuts many attractions. Day 4-7, Ko Chang Marine Park, - With 52 islands to explore the possibility for exclusive cruising are endless. Many of the islands are uninhabited and offer total seclusion and privacy. Ko Mak has crystal clear waters and white sand beaches ideal for swimming and snorkeling, excellent fresh seafood restaurants can be found right on the beach. Ko Rayang Nok is a picture postcard perfect location that has to be seen to be believed, surrounded by a living coral reef teaming with tropical fish. Ko Rang is a deserted island with excellent diving and snorkeling to be found just offshore. This is just some of what the Ko Chang Marine Park has to offer, many more hidden , exclusive locations remain to be discovered. id felis. Vivamus sollicitudin metus eget eros.